Plum Avalon produces lovely large red, purple plums with a lovely, sweet flavour. One of the finest dessert varieties the Avalon Plum ripens mid to late season and will happily keep once picked for up to a week. Avalon Plum is a modern variety and an excellent example of improvement on the traditional Victoria. Plum Belle de Louvain is a very old variety which has very large red/purple bloomy fruits with a bright yellow flesh. Its primary use is as a culinary plum as the flesh is not that juicy, however do not be fooled by this as when this plum is cooked the true flavour comes out. Plum Belle de Louvain also makes excellent jam. The large purple fruits are tender with a pleasant slightly acidic flavour. Czar can be used as a dessert when fully ripe, otherwise a good cooking plum. Self Fertile. Plum Excalibur is one of the improved Plum Victoria type varieties. This relatively new variety was introduced in the 1970s having been bred in the Bristol area county Avon. Excalibur has deep pink bloomed purple red fruits which are a little larger than Victoria and some argue a better flavour for eating directly off the tree. The fruits are large with a red skin and attractive purple bloom, the flesh is yellow, the flavour not outstanding. Plum Giant Prune was once grown commercially in the UK as it is a free stone style plum making it much easier to use for jams and chutneys. As the name suggests, Plum Groves Late Victoira is a Victoria type plum that is ready to eat nearly some two weeks after the traditional Victoria variety, picking around late September. Outstanding Victoria flavour, a good looking eat me plum. 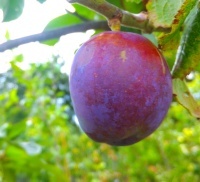 Plum Herman is one of the earliest plums available, ripening in mid-late July with blue-violet fruit similar in appearance to one of its parents the plum Czar (which we also grow) with its intense blue black appearance and yellow flesh but with much improved flavour. Large blue plum speckled with purple. Mid season eater. Large purple fruit, firm, sweet and juicy. An old favourite. A good late season culinary variety. Reliable large crops of medium sized blue fruit which keep well. Bedfordshire 1906.